Last year when ScottGu moved over to the Azure group and brought the ASP.NET and IIS teams with him, I'll be frank, I wasn't a fan. I didn't really appreciate Azure or its first iteration. The management portal was obtuse and confusing to use, the service was primarily a PAAS (Platform as a Service) offering and focused on (I thought) confusing terms like Cloud Services and slow deployments. The underlying infrastructure was strong but the developer experience didn't feel "right" to me. I really wasn't feeling it. So I continued to work on ASP.NET and Visual Studio 2012 and the things that were interesting to me. Then, some months ago Scott and some folks showed us the concepts for the new experience and the new management stuff. It clicked. I saw that Scott and his team "gets" it. I started working with it, giving feedback and filing bugs. We had weekly full-day long team app-building sessions. One particular day I sent 52 different pieces of feedback to the Portal team. I've talked before about how sometimes development on a platform can be "death by a thousand tiny cuts." It doesn't hurt in general but the little things poke at you. That's not the case with Windows Azure and this release. I'm not embarrassed to say I work for the Azure Team now, as it is pretty darned sweet. Check out Scott's post but I'll mention a few things that are new just to make the point for you that Azure is something you'll want to check out now. The management portal has been completely redone with a focus on usability and speed. It works on all browsers but the best part is that it's actually using a REST-based management API so anything you can do on the portal you can do from the API. There are command line tools to talk to the REST API so you can automate anything you like from both PowerShell on Windows or Bash on Mac and Linux. If you go to the Downloads page on the Azure site you can get .NET, node.js, PHP, Java or Python tools for Windows, Mac and Linux. And there's lots of stuff to explore. Freaked out yet? You should be. 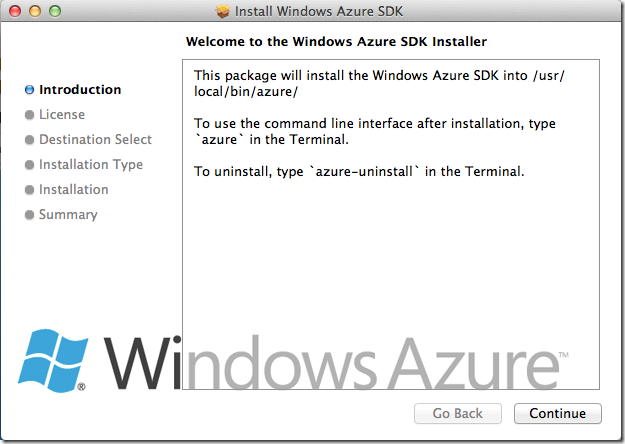 ;) The Azure SDK is also open source under Apache 2 and available on GitHub. After the install is done I'm sent to a "what's next" page that shows me how to get node, PHP or Python running (Given that I'm on a Mac). 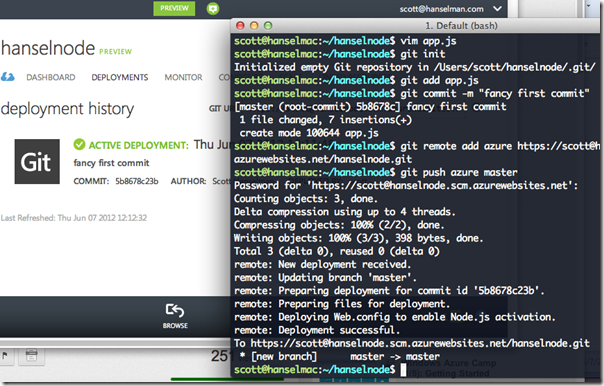 I'll install node.js and git, then I'll make a node.js application on Azure on my Mac. Now, my point isn't about node nor is it about Macs. It's about choice and it's about the ability to build what you want the way you want it with the tools that make you happy. Then I'll setup a git repository along with a name and password for deployment. 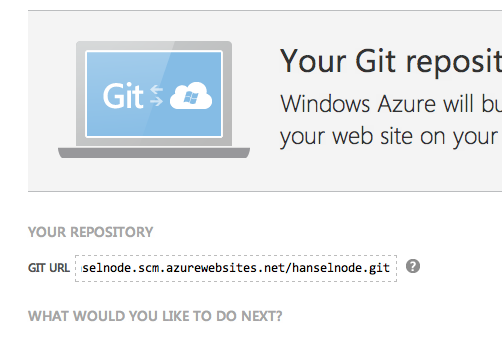 I'll make a folder, put an app.js in there, initialize the git repo, add "Azure" as a remote repo, and then push. The Azure management site actually notices the push and automatically refreshes without me having to do anything. Boom, website in the cloud, easy as it should be. Check out the YouTube video I did (embedded above also) on how to do the same thing with .NET and Visual Studio. You can use Web Deploy as I do in the video, Git, TFS or FTP. For example, I can use TFS and do Continuous Deployment if I like. 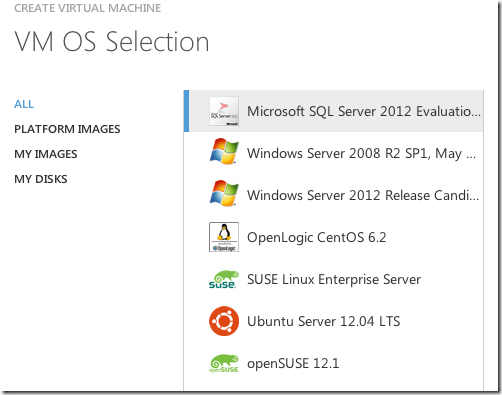 Azure has durable Virtual Machines (VMs) in the cloud now as well. You can make your own image and upload it or you can use a gallery of images that includes not only Windows but also Ubuntu, CentOS and SUSE images. 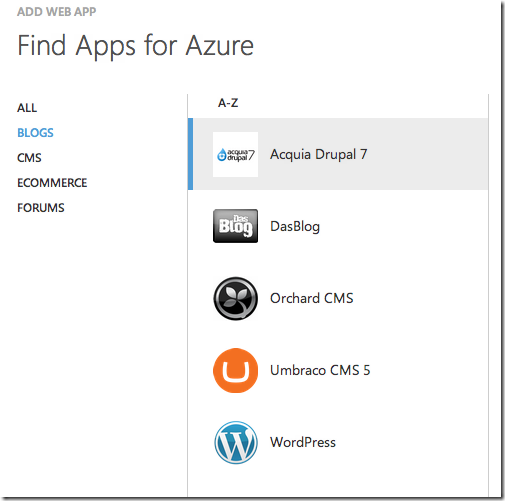 You can make a web site in Azure yourself in a minute. You can make up to 10 small websites for free to play and experiment and then later reserve instances and scale up. NOTE: To start using Preview Features like Virtual Network and Web Sites, request access on the 'Preview Features' page under the 'account' tab, after you log into your Windows Azure account. Don't have an account? Sign-up for a free trial here. Feel free to publish in a number of ways as I mentioned, using Web Deploy, TFS, Git or FTP. You can manage everything in the portal or you can automate stuff from the command line. I like that I have real choice. Use whatever tools I like, whatever OS I like to publish whatever apps I like talking to the backend that I like. I'm personally really happy with the way things are going and I'm looking forward to building all sorts of things with all sorts of tools on Azure. Agreed, Azure has come a LONG way since those first iterations. Soo cool! nice to see it's so fast! Can't wait to see the live keynote....hey, it's now, have to go. I had the same feelings about Azure, lots of Marketing push but no real clients going for it, too cumbersome, too slow, yadayada. Also felt sad, yes really sad, that 'The Gu' left us and went onto the dark side of 'Azure'. After watching your video, the Open Source Push, the new site and portal. I feel that 'The Gu' has won me back again. I have a rekindled interest in Azure. For my own blog, it is still more expensive than my current host. Of course I do not get the traffic to warrant Azure. But I can now see a lot more opportunities. Do the Mac/Linux installers also provide links to Mono, MonoDevelop and "XSP" development for cross-platform ASP.NET website development? If not, they probably should? I've been following the evolution of azure since 2008 and played with it every now and then, but just like you said, it didn't click. It sounded perfect as a idea, but it wasn't just there. the new version with the new features looks perfect. 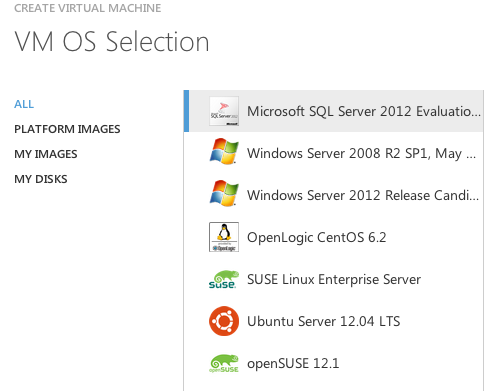 easy and fast deployment, not even a separate cloud project anymore in VS (as far as I can see). Anonymous - Yes, the Gu never left us. We are ALL under Azure now. All the "Angle Brackets" are in the same group. ASP.NET, IIS, WCF, and others are all under The Gu. Jeremy - Google around with Bing and you'll find lots of discussion of Ruby on Azure. The SDKs are all open so there's no reason it couldn't be done. I'll see if it's on the roadmap. I love the look down to the screen during the intro, nice transition. Your video production quality is beginning to rival the podcast quality. Are you doing all of the video mixing? Thanks Mike. That was actually done on my iPhone then I dubbed the audio in later on a studio mic. Did it all in Camtasia. I'm avoiding using Adobe's editor as it's overkill for me. I've been trying out Azure on and off since it launched and like others I did not really like the experience. I thought it was a great platform, but not very friendly to small web developers or hobbyists. This latest version looks really great and I'll try it out again. Also like others I was bummed when Scott Guthrie went to Azure, but you guys turned something I felt was a weak offering and turned it into something I'm excited about. There seems to be so much flexibility and possibilities now, but with added user-friendliness and simplicity for developers. I am wondering what is the most cost-effective way to get SQL Server or SQL Server Express databases if a person were to use the Azure website model? Can we develop/publish .NET 4.5 websites? As a background, for a few years now, Azure was one of the 'jokes' I used to tell. I'd ask if a developer had heard of it, and they'd invariably say yes. I'd follow that question up with if they could 'explain' it, and the fumbling began. The just seemed so bad that it really resulted in no one caring. And in 5 mins you guys (Gu+) changed that! Hey Scott, just watched the Gu and this is some really great stuff. 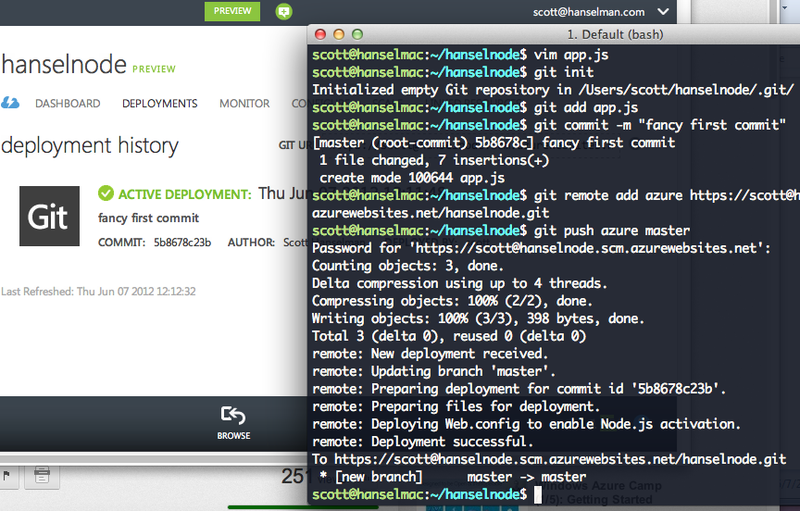 I really like that I can deploy a site so simply like how Heroku and Engine Yard are setup. I too am curious if MS wil provide an official Ruby SDK, please keep us informed. Thanks. With the new website feature, is azure a reasonable replacement for existing websites running on other hosts such as godaddy? Azure seems to have advantages in that it will scale better as traffic grows. Hey Scott, this is awesome...whats the deal with the "free" though? Faq reads like "free for a while"? I really enjoyed! 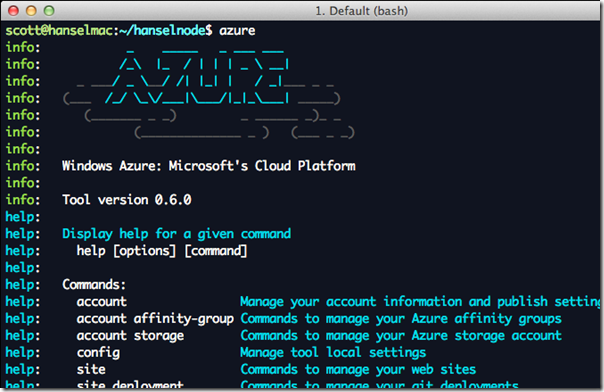 I confess that I never had the courage to try to use the Azure, but now this very simple and very flexible, congratulations for the post helped a lot, especially one who is starting on Azure! Thank you! New azure features and portal are awesome. But they missing very important thing - where is support of ASP.NET & .Net 4.5? Is there any coming solution? This is great news Scott, but do they have any form of a quote tool so that developers/CTOs can make valid decisions and cost compare how they'd setup with Azure vs. their existing technology stack? It was something Tim Heuer pointed out not that long ago in a roundabout way when he flipped that he got socked by a serious bill for his use of Azure services. Did you see the Full Azure Calculator? What about us fresh college graduates who have new ideas for a cloud storage site but are intimidated by the potential cost of Azure? I've tried to picture my site growing with Azure but the costs worry me. What if the site does not bring enough income to cover the costs of Azure? I know this is a lil off topic, but I'm liking what I'm seeing with the changes! You won't be charge unless you tell it to. It will simply turn off. Set a spending limit and try it out. Are there any current examples of using SQL Azure Reporting in an MVC app? I'm thinking I need to head down the SOAP endpoint road but would like to make sure I'm not missing a framework or package that would make my life easier. Tom - Ya, it was a little too formal perhaps. I was being "official." This has come about right time. I am thinking of moving to Azure for my websites. Nice post. I have question about the encrypted web.config sections. I had to go through some hoops(contact support in order to get some xml installed on the server) to get it working. Is there a easy way to do this in Azure? Great update. 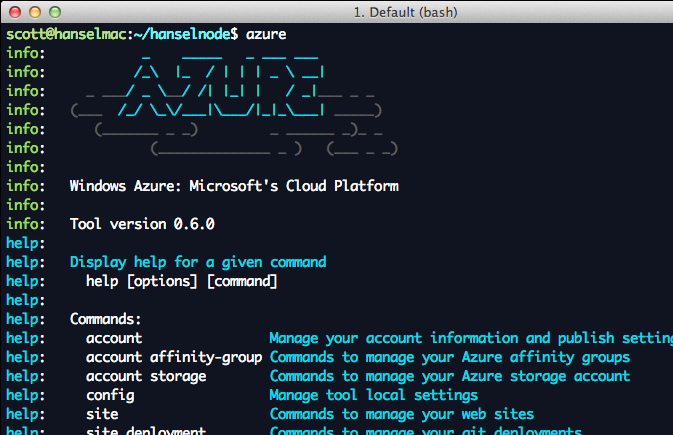 Azure is definitely coming together. I was able to deploy a web api and consuming website that I've been working on without a hitch in about an hour after setting up an account. I like how the team is thinking more about Azure as a hosting company than an experiment by attempting to guide the process, remove complications and in general make running a web app easier. Say thanks to the team for me. 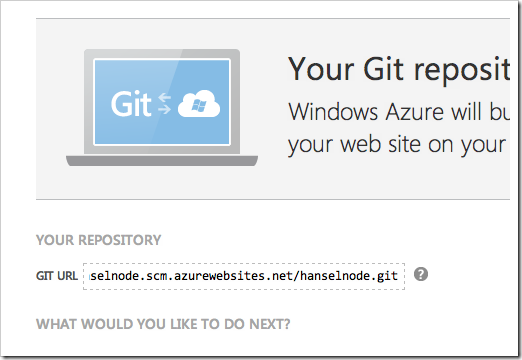 I've been trying to deploy git repositories with more than one solution in them but Azure complains because it can't work out which one to use. Is there a way to specify? Appharbor's solution to this problem is really neat - allowing matching a website name to a solution name. Can azure implement something similar? @David Pendray: you just need to add a .deployment file at the root of your repo to tell the system which project to use. This way you don't need to rename your solution. See https://github.com/projectkudu/kudu/wiki/Customizing-deployments for details. Please follow up on http://social.msdn.microsoft.com/Forums/en-US/azuregit/threads if you have more questions about Azure git deployment. Greetings Scott, maybe I'm missing something, but am I missing something or do I have to make a reserved website in order to use a custom domain name? I saw the page you indicated above about "custom-dns", but if I have 3 azure shared websites running (and I do see they all have the same IP), if I add a CNAME to my host, what will be the site that will handle the request? That looks awesome. I tried Azure to see what it is a year ago, and I didn't like it very much, just the same way you are describing. In the past year I worked with Heroku on a rails side project, and I am loving its simplicity. My first thought was, yes, this is the Heroku of .NET now. Static files should ideally be served from blob storage to make scaling easier. Also easier to update them without changing the instance deploy. I guess it would have to integrate into Visual Studio so that the files were accessible at development time in their current location (or local azure storage) and then URLs created at runtime. Hope this is possible it would make the experience a lot better for many of our projects. I still have a pure psychological problem with Azure. I really like the free year, but it actually makes me not register for Azure. Why? Because as soon as I register, the time starts ticking, so the best strategy is to register as late as possible in the project development cycle. But developing without deployment seems dull, so I don't even start. Azure is Pay-As-You-Go service. So, being unable to go nowhere (have no real CPU usage/user traffic) and pay nothing looks a bit strange. Russia is on the list, should be ready now or very soon. Also, as for as the psychological stuff, remember that it won't charge you unless you OK it. You can also always check your bill before you are charged...even hourly. Graeme - Yes we're looking at just that. Jose - We're on that. What does free for a year mean? I need to know the cost of a website so that I can communicate that to customers. I don't care if I have to start paying now. It looks like you aren't able to point a domain to a shared instance and need to update to a reserved instance? So is this even usable for production? Trevor - Upgrading to reserved is cheap, so you can do that immediately and pay immediately. I've got sites that have domains pointing to reserved sites now. Shared is free for 10 sites for now, for a year. That may change. I'd pay the few dollars for reserved (which also gives you more disk space) to use it in production. ASPConf used a reserved instance for their site recently, for example and it cost just a few dollars, then they may the instance smaller when they were done. Few dollars? I must be missing something. I think I see where you can run multiple sites on a single instance. That might work, but the instances themselves don't appear cheap. Right now I use Rackspace cloud sites. And I can put as many as I want on there for $150 a month within the quota. I haven't bothered to do a comparison regarding what i'm actually getting for that money verses Azure. Azure just seems very obtuse about what the cost is. I'm used to the low end having discrete comparable pricing. It be nice if there was some more wizards and estimates for common scenarios. WordPress under 10000 uniques a month average cost = x. That may seem like a cop out but I can't tell you how much value a fixed cost is even if I'm paying for more than I need to get what I want. I'm willing to pay the extra to not have to think about the majority of my sites resulting in cost overruns and to not have to monitor their individual prices. The free for year seems to pay lip service to this idea with a bait and switch at the end. I'll have to just keep reading to figure out what is actually possible with Azure and how that lines up with actual usage numbers to create a final price. Pretty tedious at this point. The guidance doesn't even have to be exact. Just ballpark numbers for configurations. Numbers I don't want to have to mine for myself to do the comparisons. Does anyone know when the Web Sites preview will go-live, or if a go-live license is available now? Todd - You can go live now, preview ends this fall I think. Thanks Scott. Your unbiased coverage of the .NET world is one of the reasons I'm choosing Azure for my startup. Tell Scott Hunter to give you a raise, or commission, or at least a NewEgg gift card. Azure is probably the best product I have ever seen, but that said, I won't use it because of the crazy pricing. I created a small web db and and a cloud server an started developing against it. Within a few weeks they said I had already reached by quota for the free setup. If I met the quota that fast, imagine the cost of 200 users banging away at it from their iPhone apps. better than ANY cloud something stuff. manage easier than my develope server. 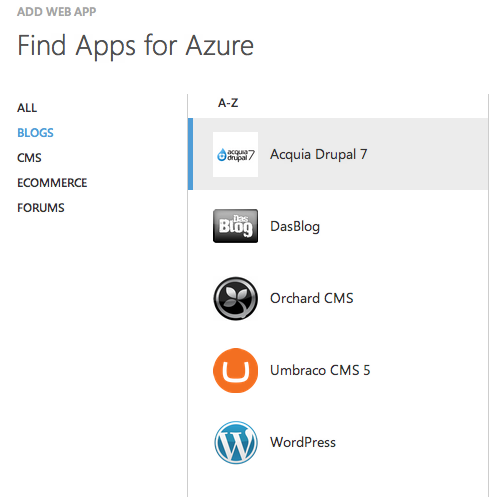 I'm having an issue with Azure Websites in general. I have code that is running very light on my virtual machines hosted in GoGrid on Windows 2012 but when I post to Azure Websites and dial up the capacity, the uptime is very sketchy. I've found similar behavior when launching node.js in comparing Nodejitsu, Heroku and Azure Websites. Azure Websites is the one that seems to fall over very easily. I know its in preview but wondering if others have experienced the same. I'm a big fan of the idea of Azure Websites as the dial up and down of capacity is awesome. I'm just not experiencing the robust behavior I imagined would be there. I'm sure WebRole is a more robust approach but I really like the idea of not having to do extra things around Azure's paradigm.